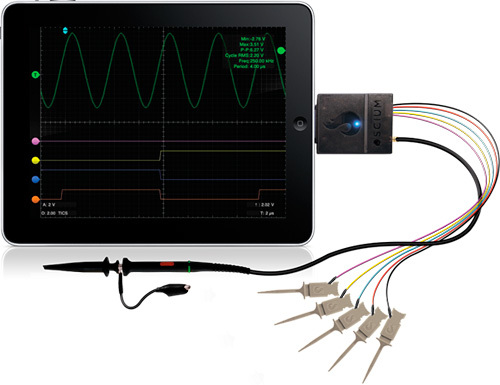 Oscium iMSO-104 Turns Your iDevice Into An Oscilloscope | OhGizmo! By Andrew Liszewski on 04/13/11 • Leave a comment! Instead of dropping $1,000+ on a dedicated oscilloscope, a new app/hardware combo from a company called Oscium promises to provide the same functionality via your iPod Touch/iPhone/iPad for just $297.99. Not exactly dirt cheap, but the solution appears to be far more affordable and flexible than a standalone unit. In addition to the company’s free iMSO app, which you can download and try out for free before buying, the iMSO-104 basically consists of a breakout cable that attaches to your idevice’s dock connector and allows you to attach various leads and probes for doing whatever one uses an oscilloscope for. The first batch of iMSO-104s has already sold out apparently, so if you want one you’d better order soon to get in on the second batch which will ship on May 20 now.